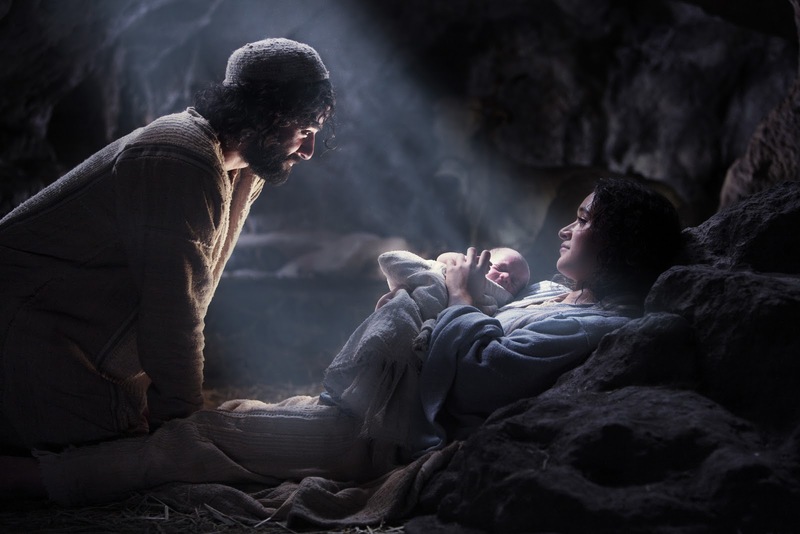 Photo courtesy of New Line Cinema - The Nativity Story. Teatime Tuesday - Want to go for a spin? Photo courtesy of Disney's website. 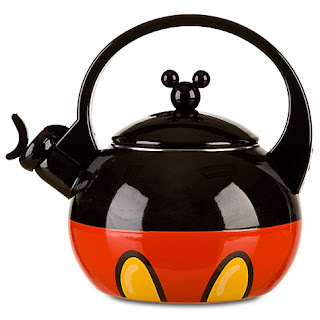 I've professed before on this blog, of my love for all things Disney and all things Alice, so of course, I love it when those two things intersect. 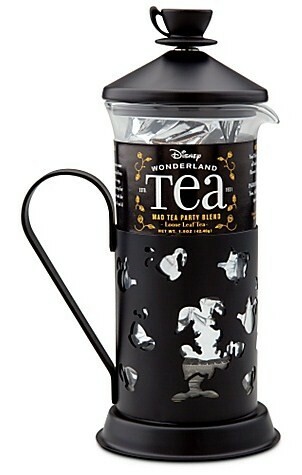 Take for example, the tea cup ride at Disneyland. 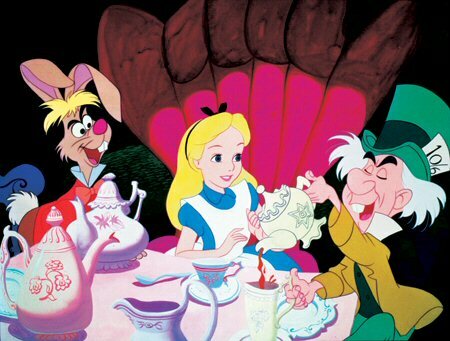 Disney's Alice in Wonderland animated film premiered in July 28th, 1951. The Mad Hatter's Tea Party attraction opened a few years later on June 17th, 1958. 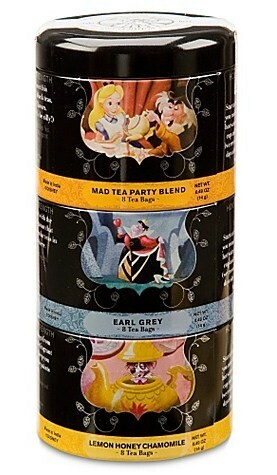 The ride is located in Fantasyland and is inspired by the "unbirthday" celebration sequence in the film with the Mad Hatter and the March Hare throwing a crazy tea party. The ride control house looks like Rabbit's house from the film. 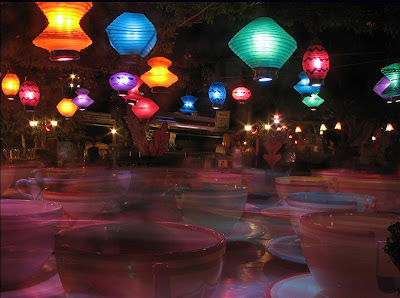 There are colorful Japanese lanterns strung over the tea party, along with lots of plants and real flowers, as well as large metal flowers that all add to the garden party feel or setting of the ride. The ride is whimsical and fun, and I think the art design of the ride really captures the spirit of the tea party in the film. There are 18 brightly colored giant tea cups to chose from and they spin on three different revolving platters which are all mounted on one larger turntable. 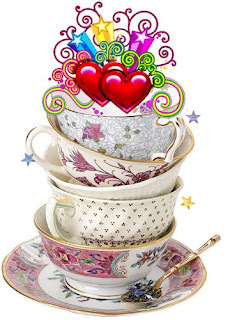 You control how fast your tea cup spins by rotating the wheel in the center of your teacup. That's a whole lot of twisting, spinning, madness! Photo courtesy of Disney Desktops at Rocket9.net. If you ever get a chance to visit - then make note that the orange diamond-decorated cup is the fastest spinner, along with the purple cup. If you'd rather take a leisurely spin through the tea party, then try to get one of the two heart cups, which are the slowest. It's better to ride this attraction earlier in the day, because the lines and wait times are longer when it gets later into the day. However, my favorite time to ride the tea cups is at night, because the lighting is just beautiful. The Japanese lanterns are lit with a wonderful glow and the large metal flowers also serve as lamps, with lights in the blossoms. It really does add another magical level to the experience. Have you ever taken a spin on the tea cups? 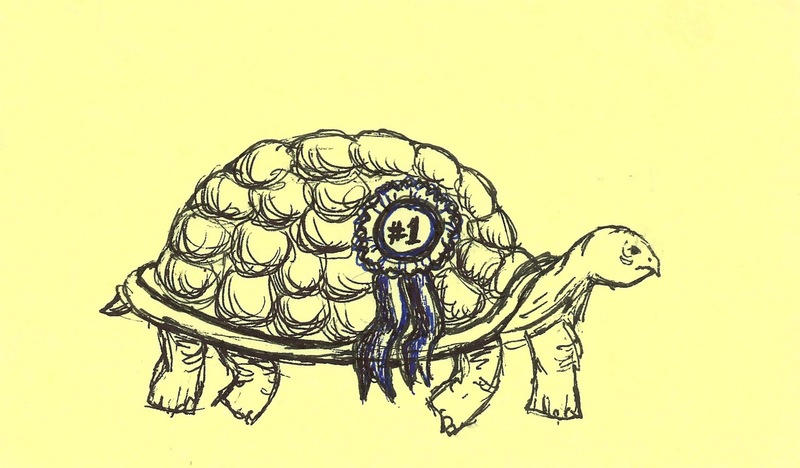 Or do you avoid rides like this because of motion sickness? What's your favorite ride at Disneyland? Leave me a comment and let me know. It's that time of year again, when the Valley of the Sun pretends to experience winter weather, the streets are filled with stressed-out crazed drivers anxious to get all their shopping done, my neighbors beat me yet again at getting the outside Christmas lights up, and my weekly musical interludes turn to Christmas music. 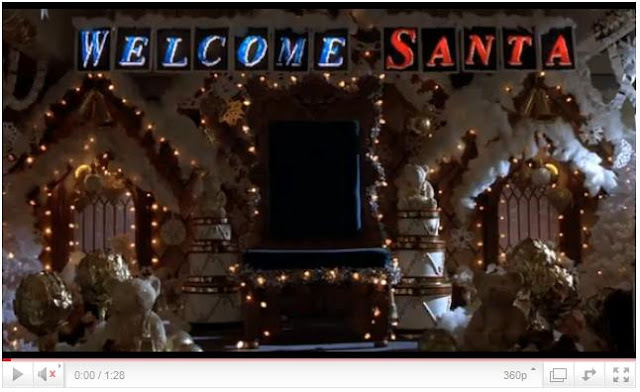 I don't remember much about the movie Elf, except that it was cute and funny. I also remember being impressed with Zooey Deschanel's singing. 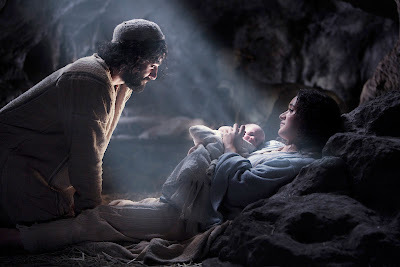 Below is a link to her singing, "Baby, It's Cold Outside" in the film. It turns out that in addition to being an actress, Zooey has her own folk/indie band called She & Him and she writes her own songs. I definitely recommend you check out some of their stuff. 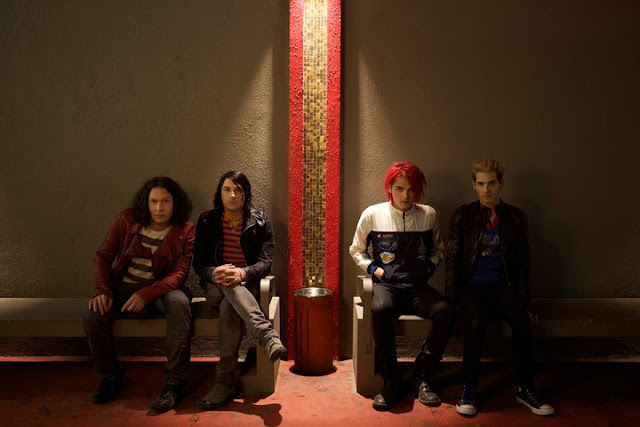 (I love this one song in particular.) She has a voice that is perfectly suited to an old fashioned way of singing. I just love the quality and color of her voice. I hope you like her too. Another short and sweet post for tonight: a video of comedian Tim Hawkins talking about Halloween candy. He mentions the infamous popcorn balls that I discussed in one of my posts. If you've never heard Tim Hawkins' songs or routines before, be sure to click on his other videos. My particular favorites are "Chick-fil-a" and "Delilah". Enjoy! I'm not sure when the whole Trunk or Treat thing started. I'm guessing it was shortly after 9/11, because I remember everyone was afraid to let their kids go trick-or-treating in neighborhoods, and they were taking them to the mall, or to private parties. Trunk or Treats are, in my experience, usually put on by churches, but I think some schools also do it. In case you've never been to one, here's how it works. Everyone parks their cars in one lot, and the lot is then roped off, so that you don't have to worry about traffic and the kids can run freely from car to car. This is much safer than kids running up and down residential streets, like they do with traditional trick or treating, with traffic or people backing out of their driveways. Everyone opens their trunk, decorates the trunk and/or their whole car, and the kids go from car to car, trick or treating. Last night was my church's trunk or treat event. It was a blast! In addition to the decorated cars, we also had carnival games like a ring toss, cake walk, etc. and food. That would be me, in the above picture, dressed as The Grey Lady (a common title for a female ghost) standing in front of my haunted abode. I took a piece of cardboard from a TV box and, using poster paint, painted the house onto it. Then I cut out the windows, so that the light from the trunk would shine through the windows. The kids had to reach through the front door to get a piece of candy. Even though there wasn't anything in the trunk to get them, I'd hint that something might get them, so they'd better be quick. (I only did this with the older kids.) Funny how our own imaginations can give us the biggest fright. I also had a game for them to play; a trick in order to get the treat. They had to throw three squishy balls into the jack-o-lantern's mouth. 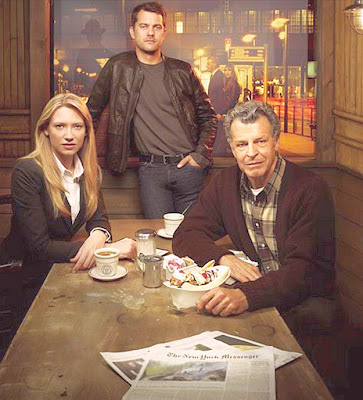 (You can see it to the right of the photo.) It was just a box that I also painted with poster paints, then cut the mouth out. I sat the box on a folding chair so it would be at the right height. I was surprised at how much this was a hit with the kids. Although, maybe it was because I was hamming it up, in character, and talking about how my jack-o-lantern was hungry and needed to be fed... We also played creepy Halloween music through our car speakers to set the mood. Again, it was a lot of fun. In fact, I think I had just as much fun as the kids did. Now I know this is going to surprise you, (Ha! 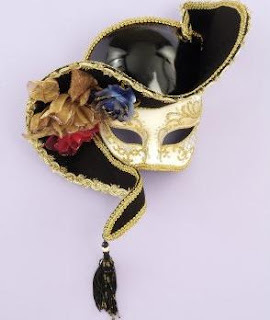 ), but when it comes to Halloween, I'm usually a traditionalist. When I first heard of Trunk or Treat, I reacted thusly: "No, no no. Trick or treating is done door to door! Where's the fun in going from car to car? How can walking up to a car replace knocking on the door of a spooky dark house, not knowing who is going to open the door?" But having experienced a couple of Trunk or Treats now, I'd have to say, they're growing on me. It's nice that it's a controlled, safe environment, but I think my favorite aspect of it, is that I get to celebrate trick or treating and Halloween with 60+ of my closest friends and acquaintances. I remember when I was little, my parents would drive me all over the neighborhood, just so I could trick or treat at our friends' houses, so they could see my costume, etc. Well, now all your friends are just one or two parking spaces away! What do you think? Do you prefer Trunk or Treat over the traditional door-to-door approach? So I didn't get this posted yesterday because I had a loooong night and was exhausted by the time I got done. I had to make decorations for our car, then had to make candies and use them to decorate a two tiered Halloween cake, all for tonight's Trunk or Treat festivities (more on that, including pictures, will be posted after the event tonight). 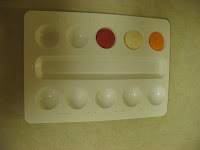 I thought it might be fun though, to do a quick little tutorial on how to make your own molded candies. They are super easy and always make for a great reaction from your party guests or candy recipients. 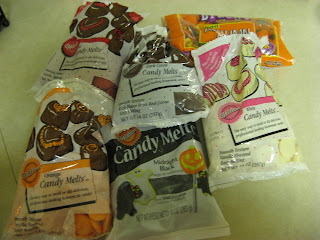 I use Wilton Candy Melts when making molded candy (see picture above). They melt nicely, are easy to use, and come in a variety of colors. You can also purchase candy flavorings if, say, you want to tint the red candy to have a cherry taste. You can get Candy Melts at Michaels, JoAnns and speciality stores. I also bought a bag of Brach's Autumn Mix, since I needed small pumpkins, and the pumpkin mold I had was too big for the scale of the cake. For this particular project, I melted my candy three different ways. 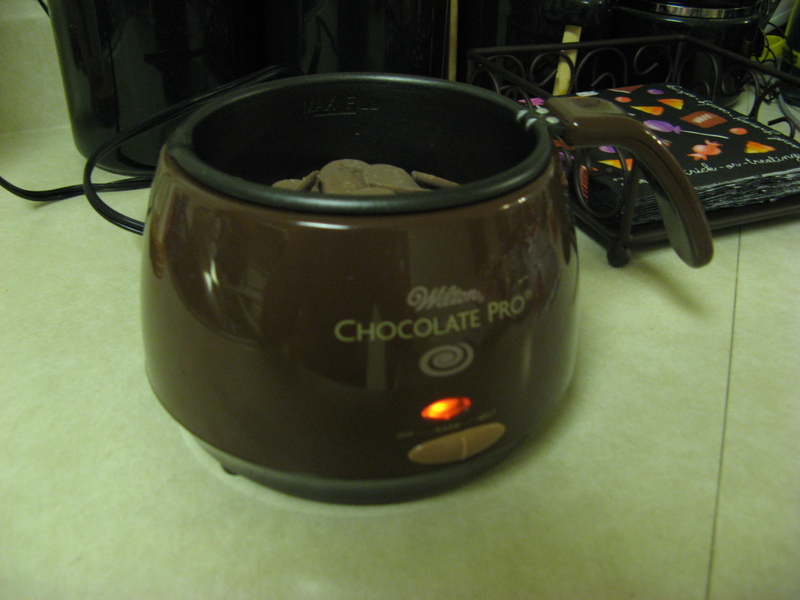 First, I knew I was going to use a lot of milk chocolate, so I fired up this little baby: Wilton's Chocolate Melter. It's a big time help when it comes to making candy. 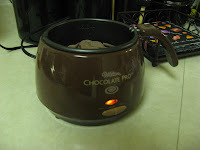 There's no messing with a double boiler, no having to reheat your pan of chocolate when it starts to get cold and sets up on you, and no separating chocolate because you got it too hot. You can dump in a whole bag of the candy melts and it melts them all down, then you can change the setting to warm, and it keeps the chocolate at a perfect temperature. You can lift the pot out of the warmer too, so you can hold it over your molds or whatever you're working on. I also use this when I'm making chocolate covered oreos. Next, I melted just a wafer of each of the three different colors that I was going to be using to paint details on the molds. I melted them in this little palate thing I have made for that purpose. I also put some white chocolate wafers, dark chocolate wafers and black chocolate wafers into three plastic disposable piping bags. All these items went into the microwave and I started melting them down at 30 percent power, at 30 second intervals. After each 30 seconds, I'd need the bags and stir the little paint pots. This slowly melts the chocolate, so that it doesn't separate. You just keep doing this until all the solids are melted and the mixture looks smooth. Using a decorating brush, I painted the details on the candy mold. Candy molds can be purchased at Michaels, JoAnns, some speciality stores and online, of course. My favorite place to shop in the Valley of the Sun is ABC Cake Decorating. They have a huge supply of candy molds for everything imaginable, and lots of awesome cake making supplies too. 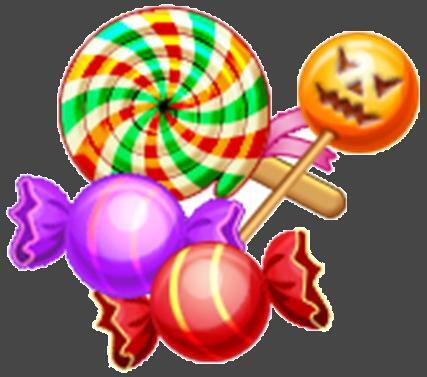 I let that candy set up, which usually takes no time at all, since it's a thin amount of candy. Then I went back in with the piping bag with the next color I wanted. For example, for the bats, I painted red on their eyes and mouths, then went in with the piping bag and filled in the bat with the black candy. 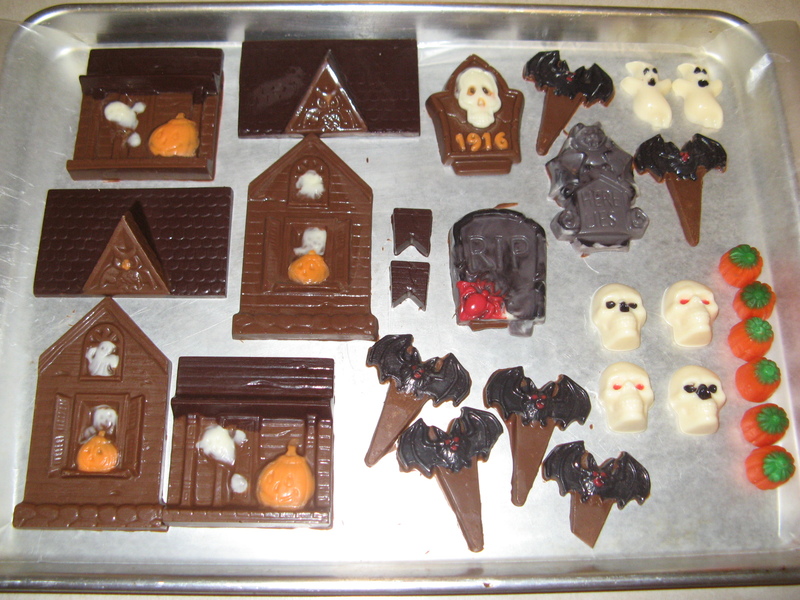 Once it set, I spooned out milk chocolate from the warmer, and filled the rest of the mold until it was level. You almost have to think backwards, or in reverse. Here's a key step, so pay attention - you need to gently tap or shake the mold, to get all the bubbles out and to make sure the candy has seeped into every crevasse of the image. 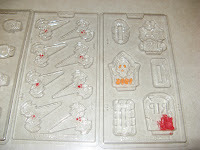 These molds are surprisingly detailed, but it can ruin the detail if you've got air bubbles or missed filling in a spot. I hold the mold up and look underneath to see if I've gotten rid of all the bubbles. For stubborn areas, I take a toothpick and insert down into the chocolate and get rid of them that way. You have to be careful when you do that, because even though you let the other colors set up first before filling in with the milk chocolate, the heat from that chocolate will re-heat the other layers and you could smear your colors together. Although, in the case of my little tombstones, I wanted to make a marbled effect for the stone, so I piped in white and black directly in the mold and then swirled and mixed them with a decorating brush. The experiment paid off and it made a streaky, marble gray. You can leave your candies out to set up in room temperature, but that takes forever. I slide my molds into the freezer, just until the bottom of the mold appears frosty or the candy is firm to the touch (just make sure the molds can sit flat in the freezer, otherwise the chocolate won't set up level and you'll have slanted candies). You can tell by looking at it if it's hardened. Then just turn the mold over onto some wax paper and they usually pop right out with little or no coaxing. Below is a picture of my finished candies, which I then used to decorate a cake (again, there will be more pictures posted tonight). You'll also notice the roof and side pieces of what looks like a house. This is one of my favorite molds. You put the four sides and two roof pieces together, using melted chocolate as the glue, to make a haunted house, which I used as my cake topper. How cool is that? 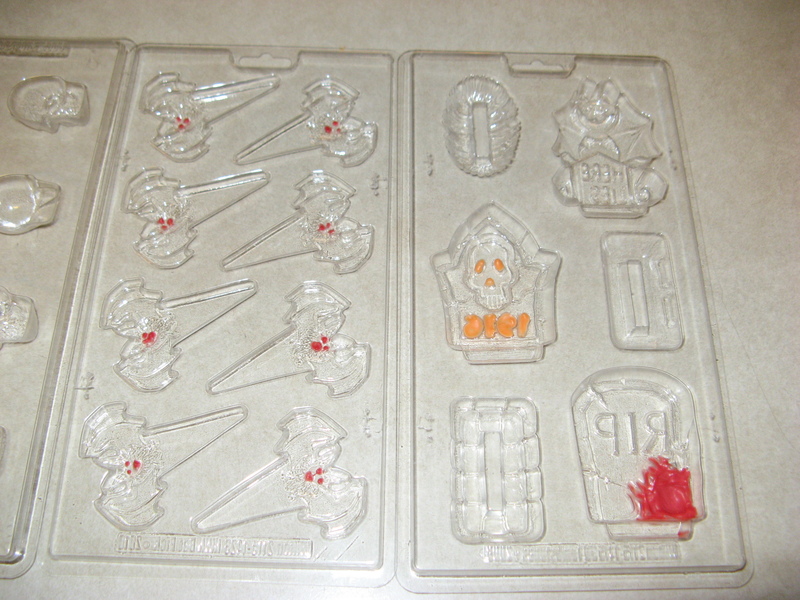 Also, the bat molds are actually shaped to be like cake picks. You know - those little plastic decorations they stick into cupcakes - but instead, you can eat these ones! Again, how cool is that? Sorry I didn't take more pictures while I was working; I was under a time crunch. Maybe for Christmas or Valentine's Day I can do another tutorial on how to make filled candies, truffles, drop candies and dipped items (like oreos, pretzels, etc.) How about you - do you make candies for the holidays? Leave me a comment and let me know. Here's a little interesting tidbit about the tradition of Trick-or-Treating. It actually dates back to the middle ages, when it was common for people to dress up in costumes and beg door-to-door for food or treats on holidays (similar to Christmas caroling or wassailing). 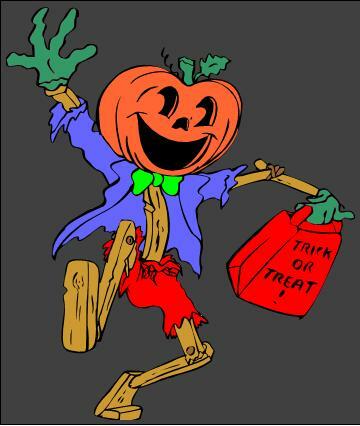 It wasn't originally called trick-or-treating but souling, when children and the poor would go from house to house on Hallowmas (Nov. 1) and receive food in exchange for promising to pray for the souls of the dead for that homeowner, on All Souls Day (Nov. 2). This stems from the Catholic tradition that souls in purgatory can be prayed into heaven by living believers. 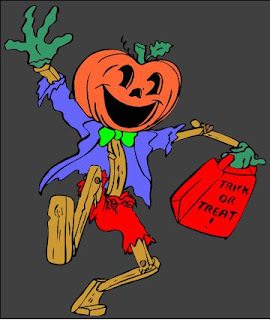 It wasn't until much later, in about the 1920s, that trick-or-treating became more of a thing that was solely for children, who would go to the shops in town and to their neighbors and sing little rhymes or recite poems in exchange for fruit or nuts. So the "trick" was actually a mini-recital. It wasn't long after, that the tricks soon became harmless good-spirited pranks, similar to toilet papering someone's house in today's time. And the nuts and fruits were replaced with candies. Out of all the candy sold throughout the year in America, one quarter of it is sold during October, for Halloween. How much is that? Try 600 million pounds of candy! I think I got a cavity just from researching that on Google. 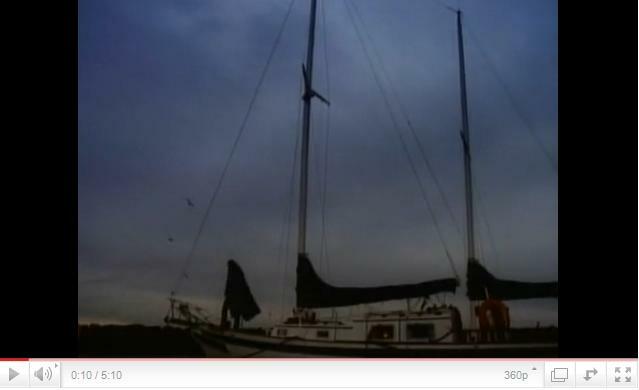 13 Days of Halloween - Quoth the Raven, Nevermore! Since I'm busy with all my crafts and assorted errands in preparation for all the Halloween activities this week, I'm going to keep this post short and sweet tonight, (or should I say short and creepy?). I love Edgar Allan Poe - he was an innovator of poetry and the mystery/thriller genre. He was an amazing, albeit tortured, author. I don't have the words or the time to go into it here (maybe another post for another time?). I also love Vincent Price. I could listen to him read the phone book. 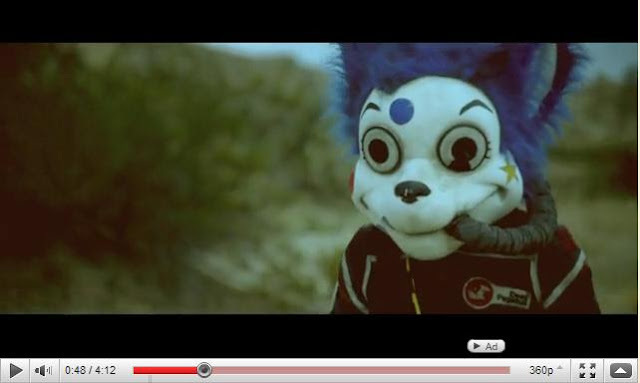 He has a beautiful, eloquent and yet sinister voice. And his films will also take a rightful place in horror movie history. So combine the two together...ah... pure genius! 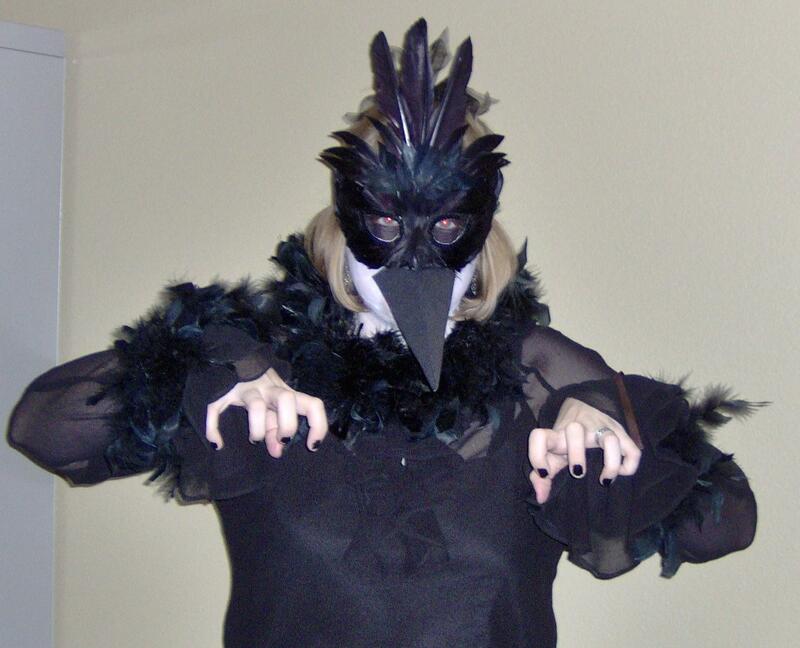 And yes, that picture above is me dressed as a raven from Halloween a couple years ago. I went around quoting "The Raven" all day (and probably driving everyone in my office nuts).